1 tbsp seafood spice Old Bay, etc..
Bring a medium sized pot of water to a simmer. Remove skin from salmon and place in the simmering water for approximately 20 minutes. Break the salmon with your hands to make sure it has been cooked through. Set aside. In a medium bowl combine 1 tbsp capers, onions, egg, seafood spice, and juice from 1/4 of the lime. Add salmon to this mixture flaking it in by hand. Using a fork, combine the ingredients in a way which doesn’t completely pulverize the salmon. There should be some good size chunks in the mix. Add about 1/4 cup of the bread crumbs to the mix. You need to make sure the mix is not too wet or too dry. Adjust the breadcrumbs until you can form the mixture into 3 healthy cakes. Spread a few more of the breadcrumbs to cover the top of each cake. Heat 1 tbsp of oil in a suitable skillet which can accommodate the 3 cakes. Once the oil is hot, using a spatula, carefully place the cakes in the sizzling oil crumb side up. Fry the cakes for about 3-5 minutes per side making sure they obtain a crispy golden crust. Set on a paper towel. In a small bowl combine mayo, remaining capers, and juice from 1/4 lime. Mix together well. Place a small bed of greens on each plate and drizzle the greens with a little olive oil and balsamic vinegar. 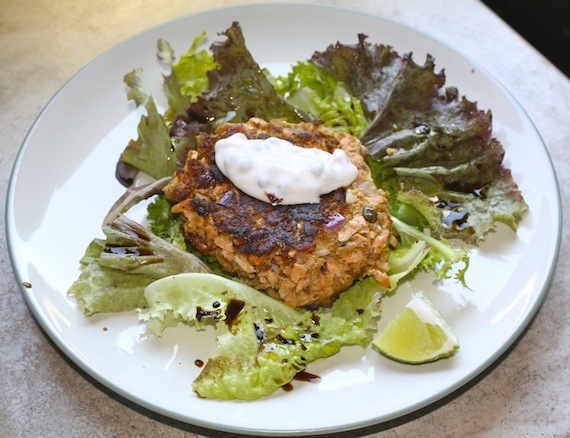 Place a salmon cake on each or arrange them all on one plate (crumb side up). Place a dollup of caper/mayo mixture on each and serve with remaining lime.